The eighth expansion for the classic tile-laying game, Carcassonne, brings you even more variety. Connect blocked roads with bridges. Turn small cities into grand castles! Claim exciting new tiles by outbidding your opponents at the bazaar. 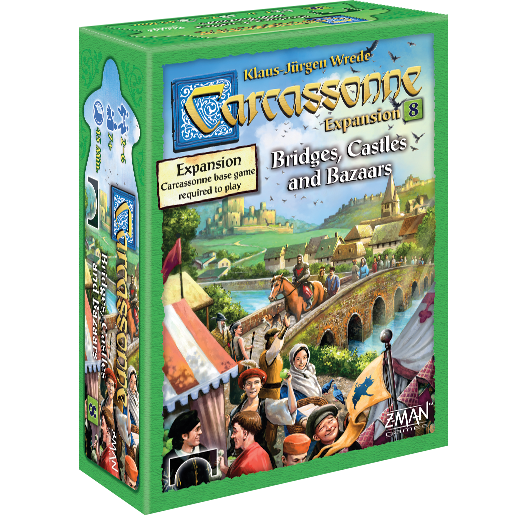 Carcassonne Expansion 8: Bridges, Castles & Bazaars is available for pre-order now through our website or your local retailer and will be in stores soon. Blocked paths won't be a problem anymore! 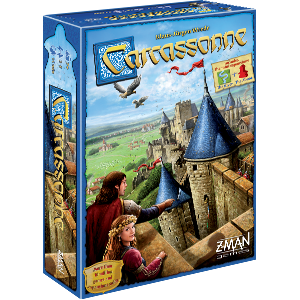 The eighth expansion for Carcassonne allows players to take the high road with bridges. Bridge pieces will continue a road and connect tiles. In a 2-4 player game, each player will have 3 bridges and 3 castles to place. In a 5-6 player game, each player will have 2 bridges and 2 castles to place. Choose wisely when to place your bridge pieces. A strategic choice could turn the game in your favor. 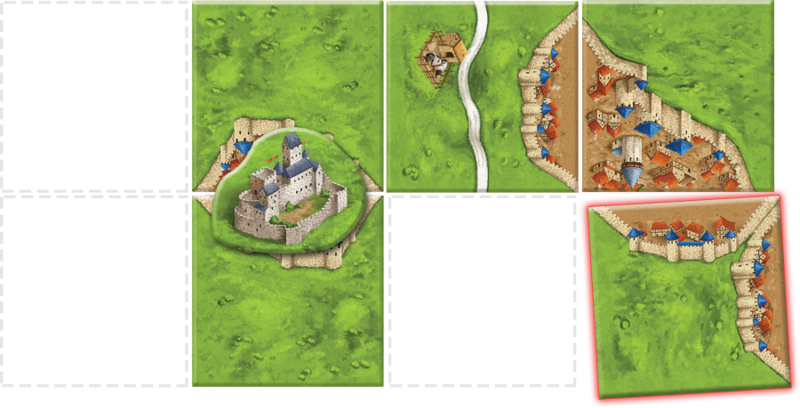 Just like in the base game of Carcassonne, tiles must be placed to match the edges of the tiles already in play. After placing a tile, you may place a bridge. The bridge piece connects roads over features or meeples on that tile. When a bridge is placed, both ends of the bridge piece must be in a field. In the example below, the bridge is placed incorrectly with one end of the bridge landing on top of a road on that tile. A road can be continued by multiple bridge pieces. As long as the bridge’s ends are in a field, bridges can connect a road over more than one tile and go over features. Scoring roads with bridges is just like scoring roads regularly. The bridge piece connects the road and once a closed path is created, it scores. Here the tile with the monastery connects a road to the bridge and that path ends at the bazaar on the other tile. The player that placed the monastery tile to complete the road will get 3 points. When placing a tile that completes a small city, you can choose to score the 4 points for the city or transform it into a castle and take the gamble for more points. Castles rely on the features in the surrounding environment. Once a player has upgraded the small city into a castle, they’ll score points from the next neighboring feature that is completed. In the example below, a neighboring city is completed. The player completing the city will score 6 points. The player with the castle will also score 6 points. Take the high road with bridges or gamble for a bigger reward with the castle. 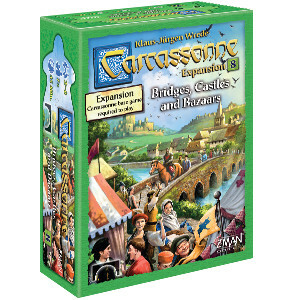 Carcassonne Expansion 8: Bridges, Castles & Bazaars adds even more variety to this classic. Grab your copy today!